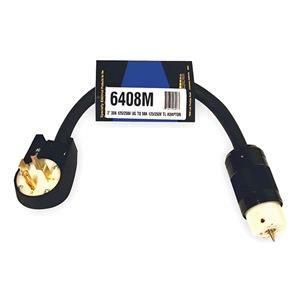 nema 14-30p plug to 50a 125/250v Twist 6365M to connect to temp power cord or box. Note: 30a 220v breaker on supply panel may only allow 60 amps 110v total use from temp power box. * Please call us for any questions on our extension adapt 30ap 50ar l1430p 50atemp rentals in Portland OR, Gresham OR, Milwaukee OR, and surrounding metro area.